This August, I was delighted to have the opportunity to create a baby shower to welcome a new little girl into the world. When the hostess told me that the theme was The Secret Garden, I was utterly delighted. That Frances Hodgson Burnett novel had been one of my very favorites when I was young. Turns out, the theme wasn't actually a reference to that children's book, but I still used it loosely as my inspiration to create a magical scene of a garden that felt almost like something from another world. I immediately thought of the Chanel 2009 runway show, and knew what I wanted to do for my backdrop. 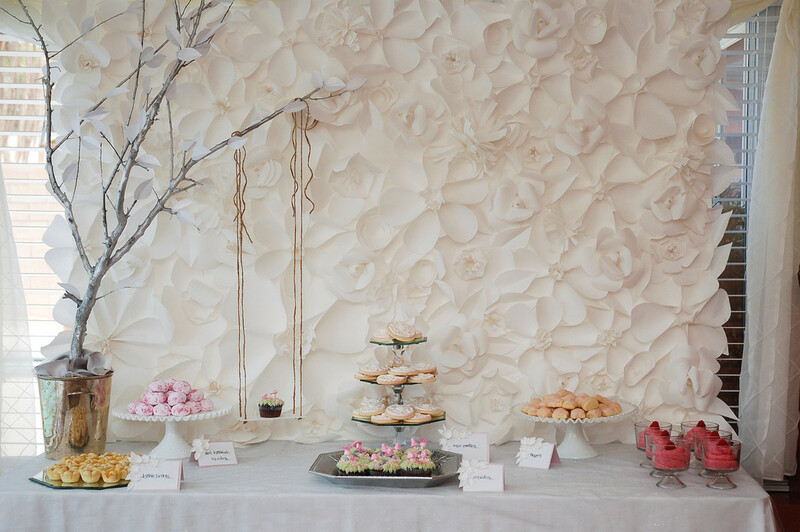 A garden wall of paper flowers, all white. I wanted to play with texture, with light and shadow, more than color for this party. I'll be posting a tutorial for how to make one of these show-stoppers for yourself, and you'll be amazed at how inexpensive and easy it is. 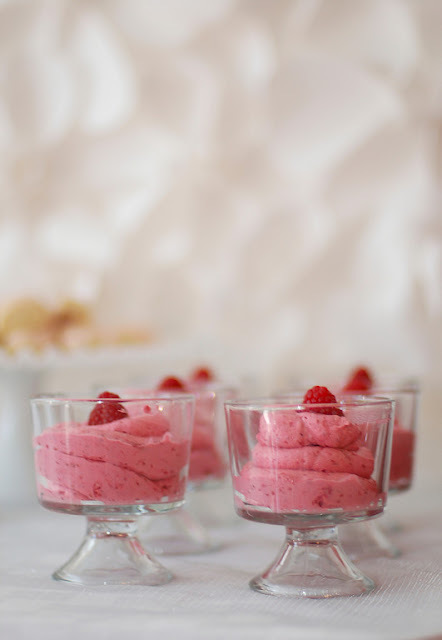 Raspberry mousse is a delicious, delightfully pink dessert. And any excuse to use my mini trifle dishes is a good one! The brush-embroidery cookies were so easy to make, and looked so amazing (if I do say so myself!)! 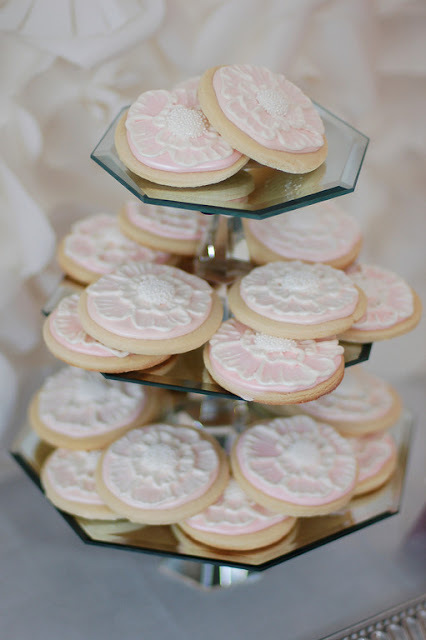 I also love how my mirrored cake stands came out, and I can't wait to share the tutorial for those as well. They added just the right sparkle and flash to the display. The cupcakes were inspired by Zalita of Cupcake D'Lights. 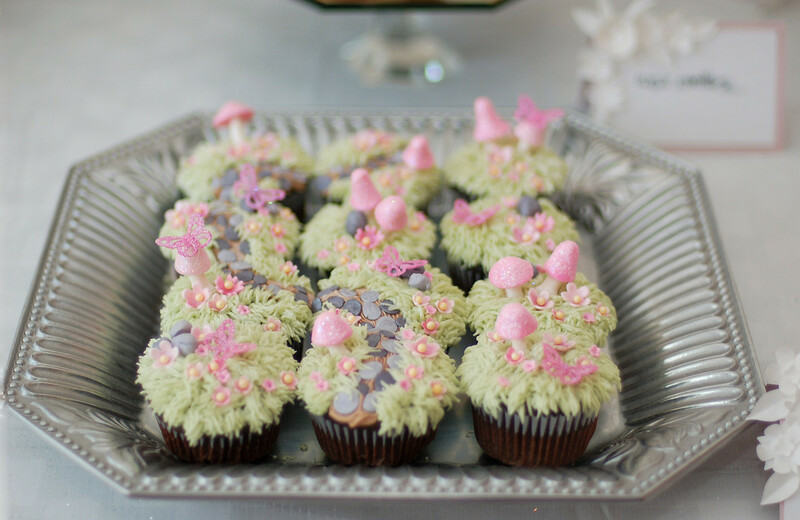 Her cupcakes always astound me, and are so amazingly creative and detailed. Head over to her Flickr stream for some serious beauty and inspiration. 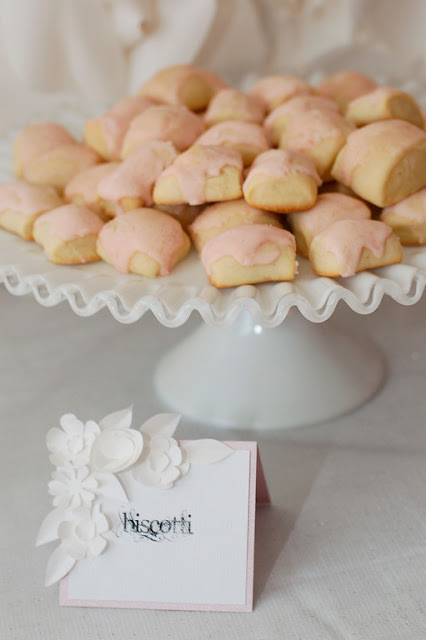 When thinking about pink confections, I remembered these biscotti. 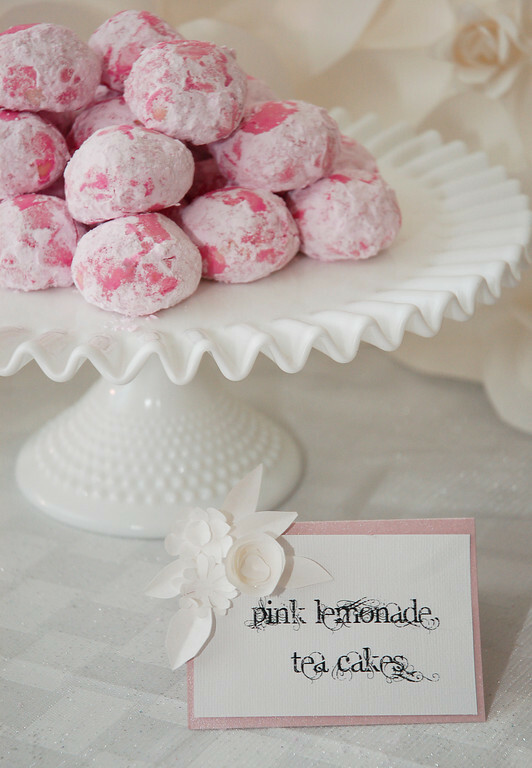 Pink pillows of deliciousness with a light vanilla and anise flavor. The subtle sweetness of this traditional Italian recipe is absolutely addictive. Good thing the recipe made a huge batch--plenty of cookies for me to taste test. You know, for quality control. Many thanks to the Zappanti family for sharing their family recipe with me for this party! I carried the paper flowers theme through the table tents as well, using simple paper punches to create a miniature version of the backdrops. Wouldn't these make absolutely stunning place cards for a wedding? Pink Lemonade Tea Cakes were a fun and successful experiment. I created the recipe as a riff on Russian Tea Cakes/Mexican Wedding Cakes. All that buttery, tender goodness with a bright citrus flavor and pretty pink color. Want to learn how to make them for yourself? Pop over to The TomKat Studio blog for a how-to post and the recipe! 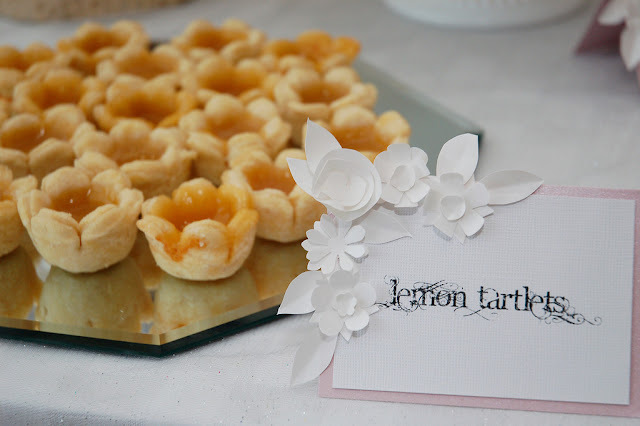 The lemon tartlets weren't pink, I know, but the flower shape and lemon flavor made them irresistible for the party. 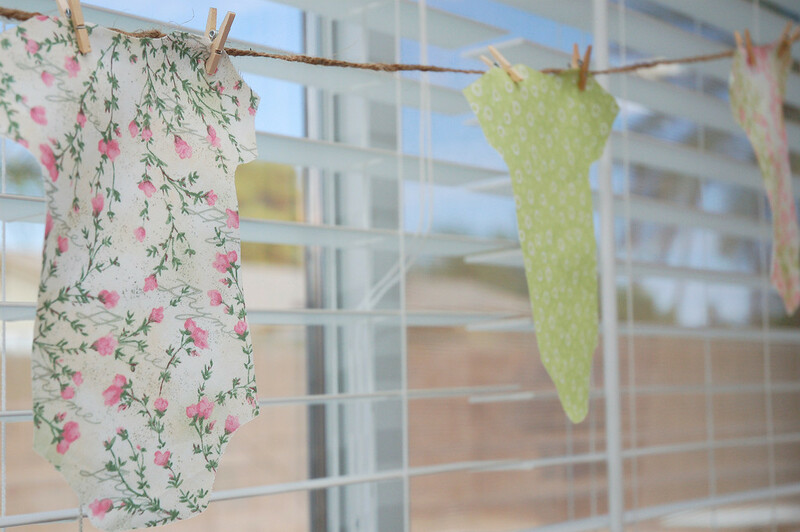 This was a baby shower, after all, so I created this simple, but utterly adorable onesie bunting. The beverages had white-on-white textural floral signs, too. 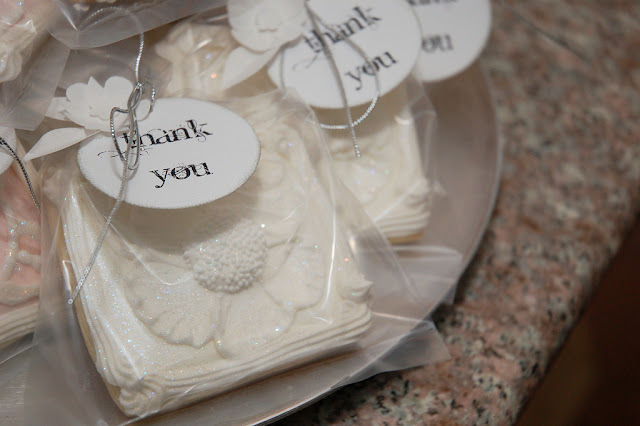 As did the simple thank-you tags. 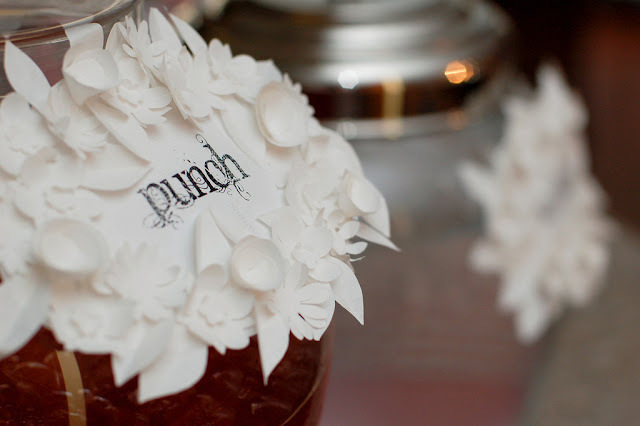 It's amazing how much elegance and dimension one little paper flower can add to a package! 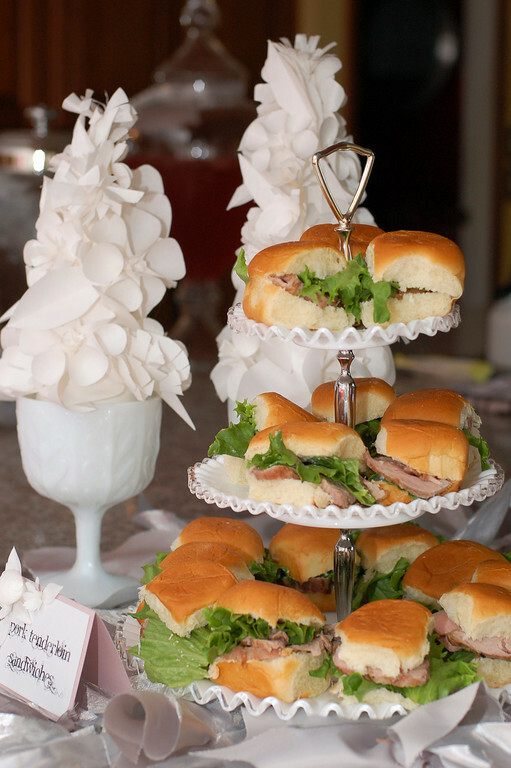 Savory snacks included pork tenderloin mini sandwiches with a horseradish mustard spread. Cheese and crackers are so much more special when the crackers are homemade rosemary sea salt crackers, and the plate is garnished with adorable miniature champagne grapes and raspberries. 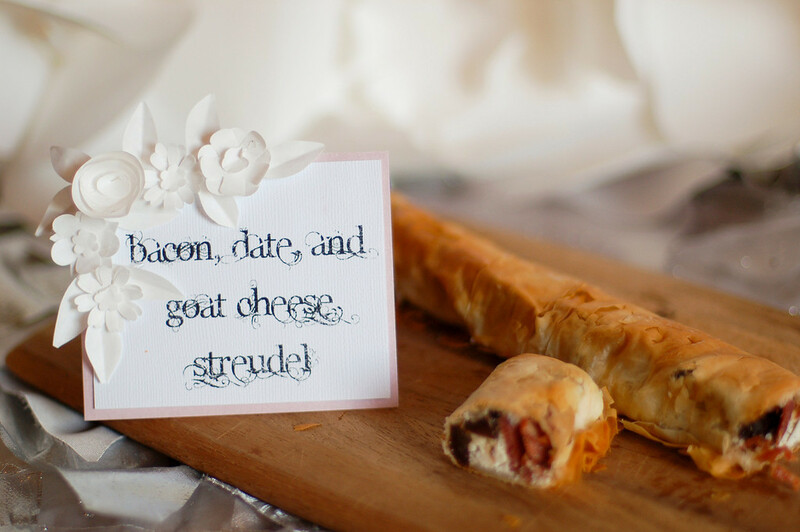 The bacon, date, and goat cheese streudel was a huge hit, and was so simple! It's a great make-ahead appetizer. 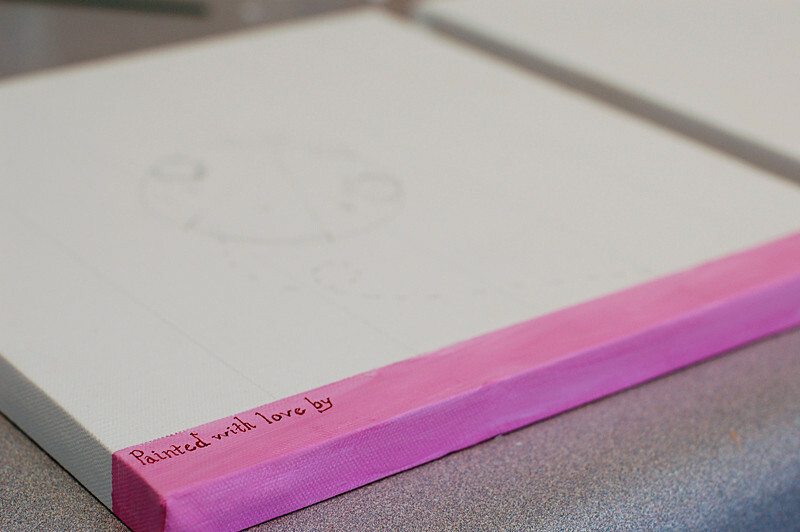 For an activity, I came up with the idea of making custom paint-by numbers canvases. The design was inspired by the bedding the mother-to-be had registered for. 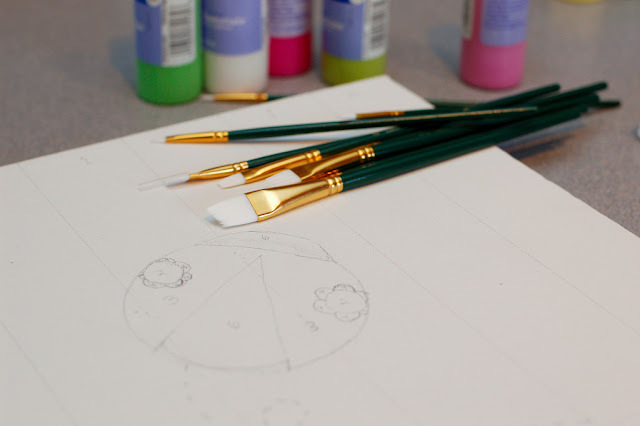 Each guest at the party could paint a piece of the picture using the easy color-coded canvas and paints. And after adding their contributions to the artwork, the guests signed the canvas. An activity, a gift for the parents, nursery decor, and a loving memento of the people who came to celebrate the new baby, all rolled into one! I'll be starting the series of how-tos for this party tomorrow, so be sure to come back for lots of great info! And I have to note that this post marks the one year anniversary of my blog. What a marvelous adventure this has been so far. Thank you so much to all my readers for your comments, support, and friendship. Here's to many more years to come! LOVE everything about this. You rock my socks off! This is gorgeous! I love the white paper flowers on everything! What font did you use for all the signs? It's lovely! It's called Angelic War, and I got it from http://www.1001freefonts.com/ I knew it was perfect as soon as I saw it! BEAUTIFUL!!! I can't wait for your tutorials! Love the baby onesie bunting and that backdrop is gorgeous!!!! It is all amazing but I think my favorite is the onesie bunting. It is just so sweet looking. What a creative idea! You amaze me yet again... that backdrop is absolutely stunning. This is spectacular! I recently posted about a baby shower I threw last weekend and this puts it to shame! Great job and definitely a new follower! May I come and live with you for awhile so some of your creative magic rubs off on me?! You might guess I love the paper flowers, but every single little detail is fabulous. 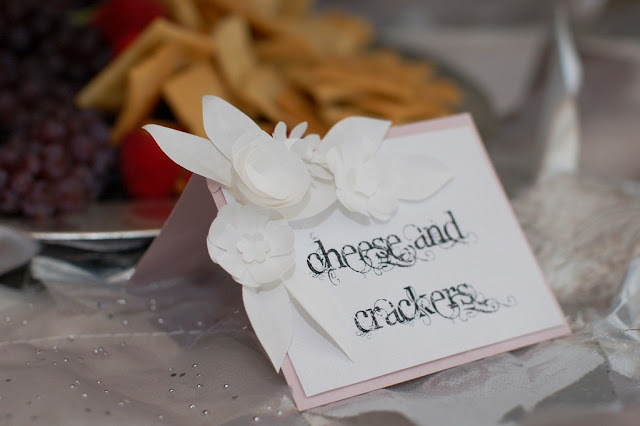 How did you make the place cards? Can you make a tutorial for the food labels and the signs and little trees of the paper flowers love the theme adorable. what font did you use to do the cards? it is gorgeous!!!! !